If your home is anything like mine, the weekend after New Years can be a dreary one. The tree and decorations are either already down, or they will be coming down, and winter has settled in for its long stay with us. But do you really have to stay in just because it is cold and snowy? I think the answer to that question is an easy one. In Fairlee the weekend of January 8th and 9th is anything but a dreary let down. It's time for Lake Morey Winter Weekend, two days of events put on by the Hulbert Outdoor Center, Upper Valley Trails Alliance, and the Lake Morey Resort. The weekend kicks off on Saturday with two separate events. From 10 am to 4 pm The Upper Valley Trails Alliance sponsors The Lake Morey Skate-a-Thon at Lake Morey Resort. I attended this event two years ago and tried Nordic skates for the first time. The participant can bring their own skates or they can can borrow Nordic skates from the Norwich based business, Nordic Skater. These skates are ice blades that you clip into the shoe much like a ski boot. The longer-blade skate was developed in Sweden and are often worn for long distance skating on natural and outdoor areas, using a cross country skiing like motion. 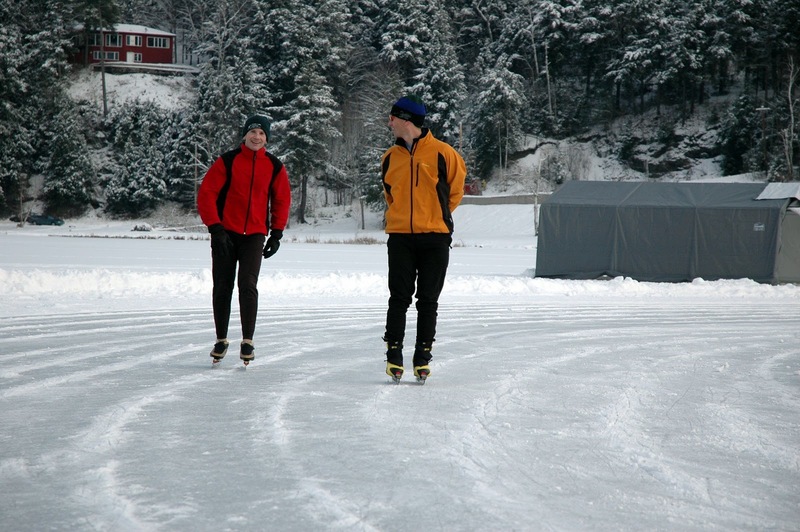 The trail on the edges of Lake Morey, the longest ice skating trail in the United States, is the perfect place to give these European skates a try. The day on the lake is rounded out with a lunch provided free with admission by my favorite place to get a burrito, Boloco. The event raises money for the Upper Valley Trails Alliance. For members of the Trails Alliance the cost of the event is $20 for adults and $10 for participants 12 and under. Non-member adults can participate for $25 for adults, and $15 for people 12 and under, with all children under three for free. Also on Saturday, over at the Hulbert Outdoor Center, Winter Skills Day will be teaching its participants how to rough it during the frigid part of the year. 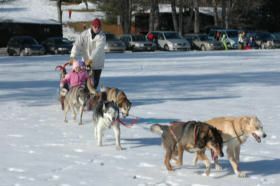 Classes are varied and include a few that have already gotten me excited such as a course in learning how to build an Igloo with Dr. Bert Yankielun, who used to be a researcher with CRREL in Hanover, dog sledding with musher Ed Blechner, and winter camping with the staff of EasternSlopes.com. Each course is $27 unless otherwise specified. You can preregister by calling Lynn Daly at the Hulbert Outdoor Center, 802-333-3405. 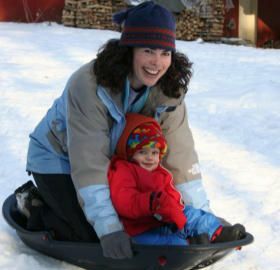 The weekend ends on Sunday with a day of family winter fun, at the Lake Morey Winterfest. This day will have something for everyone who loves to be outside in the winter time. There will be storytelling, and a hayride, said Deb Williams of the Hulbert Outdoor Center. There will be old fashioned ice cutting demonstrations, skijoring demonstrations, live music, snowshoe hikes, and an ice fishing demonstration, and much more. Winterfest is $7 for individuals and $20 for families. The weekend has called for 100 volunteers in the past, said Deb. If you would like to volunteer at Lake Morey Winter Weekend you may email Deb at deb_williams@alohafoundation.org. Enjoy some outdoor fun this weekend!